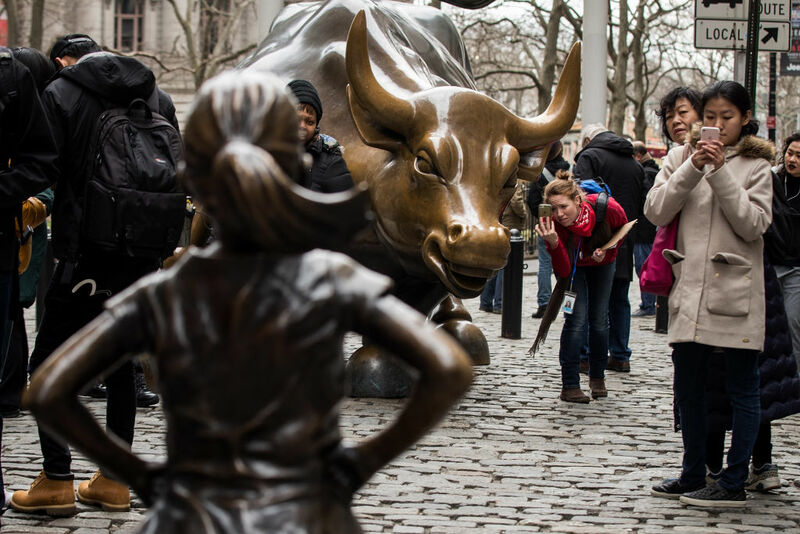 People take photographs of the 'The Fearless Girl' statue as it stands across from the iconic Wall Street charging bull statue. Among the business sectors largely absent from the current deluge of sexual harassment revelations is the financial services industry, a behemoth that employs 3.2 million people in the United States and is infamous for abuse and discrimination targeting women. New data suggests that, along with Hollywood, the media, and the restaurant industry, finance might deserve a new turn under the hot lights. 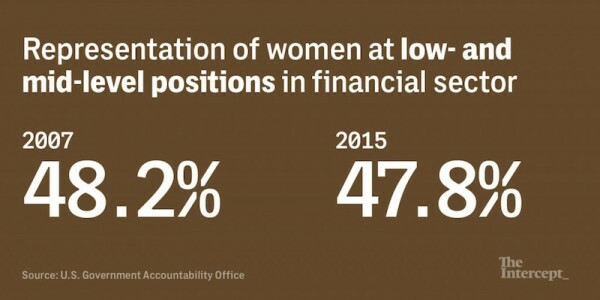 A new report from the Government Accountability Office finds that women have made no progress increasing their ranks in management in the financial industry since 2007, with women in New York, home to Wall Street’s power center, faring worst in the country. Experts in workplace discrimination say that poor pay and promotion practices often are found in the same workplaces where harassment is prevalent. And if Wall Street women are staying quiet, they say, it is not because the industry has reformed itself. “Many of them are subject to arbitration agreements,” said Nancy Erika Smith, the New Jersey employment lawyer who represented former Fox News anchor Gretchen Carlson in her sexual harassment lawsuit against chair Roger Ailes. Indeed, Wall Street has been a pioneer in the use of closed-door arbitration, using the secret proceedings for decades to keep embarrassing disputes out of the public eye while protecting its predatory rainmakers. Further silencing women is that “Wall Street has really perfected blackballing women,” Smith said. 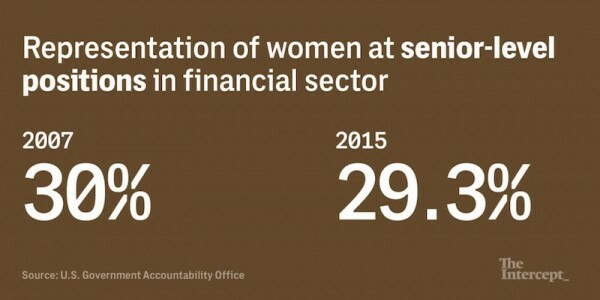 The GAO report, released on Friday, said that women in finance make up only 29 percent of senior jobs at banks, trusts, insurance, and securities firms. 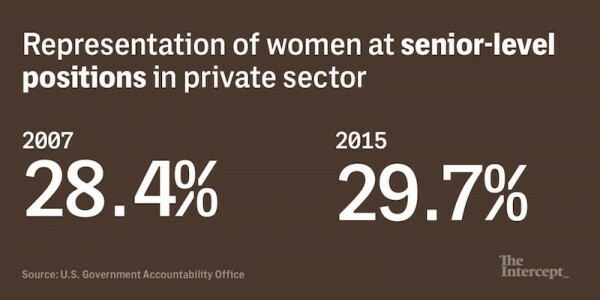 Among white women, the senior ranks were down nearly a percentage point, while minority women saw a 0.3 percentage point increase in the time period studied, 2007 to 2015. Among the four finance sectors the GAO examined at the request of Sen. Sherrod Brown and Reps. Maxine Waters and Al Green, women at securities firms fared worst in terms of being hired for management positions. Only the insurance industry saw an increase. “The conditions that might erect barriers to advancement would be among the same kinds of conditions that could promote higher risk of harassment,” said Joseph Sellers, a Washington, D.C. employment lawyer who has represented women in class-action lawsuits against Walmart and Sterling Jewelers. Sellers said that with its ethos of raunchy humor and other “shared values” among men at the top, Wall Street is an unusually tough place for women looking to get ahead. In the 1990s, major Wall Street firms took embarrassing public relation blows when groups of women at Smith Barney, Merrill Lynch, and other firms banded together to bring class-action lawsuits that laid bare a culture that was demeaning and sometimes dangerous. At a branch office of Smith Barney, where a basement party spot had been dubbed “The Boom-Boom Room,” birthday gifts to colleagues included visits from strippers. Boston-based Fidelity Investments briefly brought finance into the conversation in October when it fired two top men — one for harassment, the other for inappropriate sexual comments. But that did not trigger a spate of women in finance to go public with harassment allegations, which comes as no surprise to Vanderbilt Law School professor Joni Hersch, who has done research that suggests that industries with a culture of harassment like finance in effect offer a “hazard pay” premium to their employees. The bias against women is even at work when it comes to punishment for wrongdoing. In March, three finance professors published a research paper that said rule-breaking female financial advisers were punished more severely than their male peers and were less likely to get new jobs once they were fired. Male advisers, in the meantime, engaged in three times more misconduct than females, the professors said. The GAO report looked at three tiers of managers. 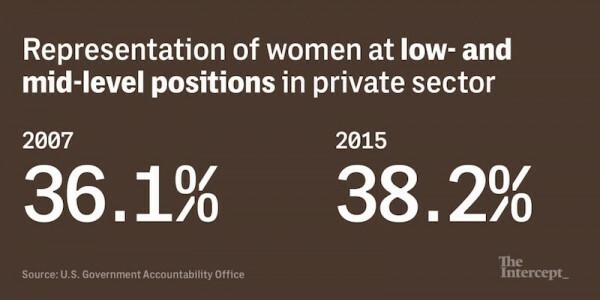 Women in the low- and mid-levels of management declined slightly from 48.2 percent to 47.8 percent between 2007 and 2015, while senior women dropped from 30 percent to 29.3 percent. Addressing the possibility that women might not be getting ahead in finance because of gaps in education, the report pointed out that between 2011 and 2015, women earned 58 percent of bachelor’s degrees, 60 percent of master’s degrees, and 45 percent of MBAs. In the wake of the lawsuits of the 1990s, the Securities Industry and Financial Markets Association, the lobbying group for Wall Street, launched a biannual survey to begin tracking progress for women and minorities. By 2007, the portion of women in the industry had fallen to 42 percent, from 43.5 percent in 1999, SIFMA found, and “women are being hired at rates below their current representation at almost every job level.” Women’s ranks fell further, to 36 percent, in 2011. We don’t know whether those numbers have sunk even further. A SIFMA spokesperson once told me that she would share the 2016 report when it was published. After sending several requests, she told me the results would only available to the brokerage firms that participated in the survey. When SIFMA held its annual meeting in Washington in October, among the sessions open to attendees was “Championing Diversity & Inclusion,” a panel to consider “strategic solutions” to bringing change to the C-suite. Three attendees at the session told me that neither the Harvey Weinstein scandal nor the Fidelity firings – a story in the previous day’s Wall Street Journal – came up in the 70-minute discussion. There had been high hopes that the scandalous Wall Street gender cases of the 1990s would change the industry’s culture and give women a new confidence that they could speak out about discrimination in the workplace. But 20 years after that lawsuit, when I contacted some of the most vocal female litigants of the Boom-Boom Room era to discuss the state of things for women, several declined to be interviewed for a reason I hadn’t anticipated: Despite their initial gutsy stands, by 2016 they were afraid that speaking publicly would imperil their jobs. This article was reported in partnership with The Investigative Fund at The Nation Institute, now known as Type Investigations and first appeared on The Intercept and is reposted here with permission. Follow Susan Antilla on Twitter at @antillaview or email her at susan.antilla1@gmail.com. Susan Antilla is a reporting fellow with Type Investigations.